“When in rehearsal, our director, Laurel Green, asked us to create the characters of the ‘Spectators at the Calgary Stampede’ (our version of the County Fair from E. B. White’s classic tale Charlotte’s Web), she asked Actor Sarah Wheeldon and I to create two ‘grandmother’ characters. Of course, I immediately thought of my own grandmother who is 97 years old and living in the Chinese Seniors Lodge in Edmonton, Alberta. Because my grandmother is so elderly and with being away from her over the holidays, she was very much on my mind. I think I subconsciously wanted to be close to her and so I began to create a loving tribute to her in my ‘Spectator at the Calgary Stampede’ character. I have always loved my grandmother’s idiosyncrasies… her little sayings, her gestural vocabulary, the way she moves in space and her voice. While in rehearsal, we were often remembering our own first encounters with the story of Charlotte’s Web as children. As I looked back, I thought of how wonderful it would have been for me as a young, Asian Canadian to have seen a character like my grandmother in the story when we studied it at school. I would have loved to have seen her at the Calgary Stampede, meeting Wilbur and having a wonderful time. 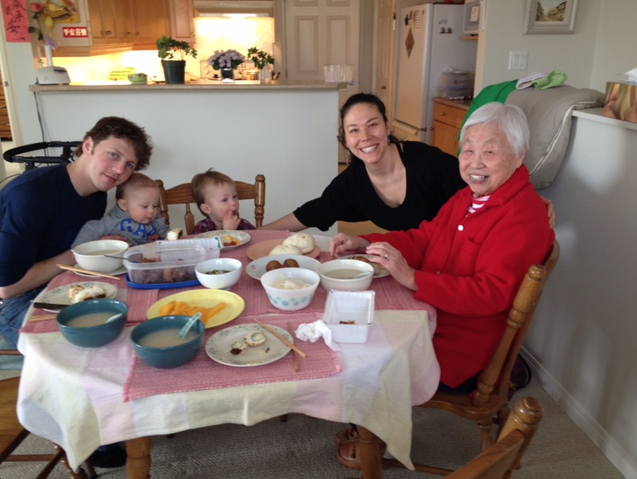 Pictured: Actor Nadien Chu with her grandmother and other family members. Learn more about ATP’s 2017 Holiday Show Charlotte’s Web HERE.